Day 03: Private Sacred Valley Tour. Ollanta – Aguas Calientes Train. At 2PM you will be met at your hotel to enjoy the wonderful sites around the city. Visit Koricancha- Temple of the Sun near the center of Cusco. Sacsayhuaman- 15 minutes outside of Cusco with huge walls comprised of monolithic stones, Q’enqo – a small cave like structure used in Inca ceremones, Pucapucara- the small fortress and Tambomachay with its fountains and small canals. You will be met in your hotel at 09:00 to start your tour of the Sacred Valley. After breakfast store your large luggage with your hotel’s front desk and bring an overnight or carry-on bag. The trains cannot accommodate large luggage. You will be met by your guide and driver in your Cusco hotel and taken on a tour of the Sacred Valley. Drive north from Cusco to the the artesanal town of Chincheros with its small church where some of Cusco’s finest weavings are handmade. Lunch today is at a hacienda style house to relish local Andean food such as the super grains-quinoa, kiwicha and maca, alapaca meat and other wonderful local dishes. Finally climb the magnificent wall of Ollantaytambo. Rugged steps rise high above the small town to see where and how the Incas guarded the Sacred Valley to the north. More Inca miraculous stones await you at the top of the wall. The train station at Ollantaytambo is where you will board your afternoon train to Aguas Calientes (90 min). You will be met in AC and escorted (walk) to your hotel. Overnight Aguas Calientes. (B, L). After breakfast check out and store your overnight bags with your hotel. You will be met by your guide to walk to the buses to take you up to Machu Picchu’s entrance (20 min). Enjoy 2 hrs with your guide then have plenty of time to hike and explore the park on you own. Machu Picchu was probably an estate of the Inca Pachacutec, who also designed Cusco. It was a town with individual homes for nobility made in the classical Inca style with polished dry-stone walls. Its 3 three primary structures are the IntiHuatana, the Temple of the Sun, and the Room of the Three Windows. 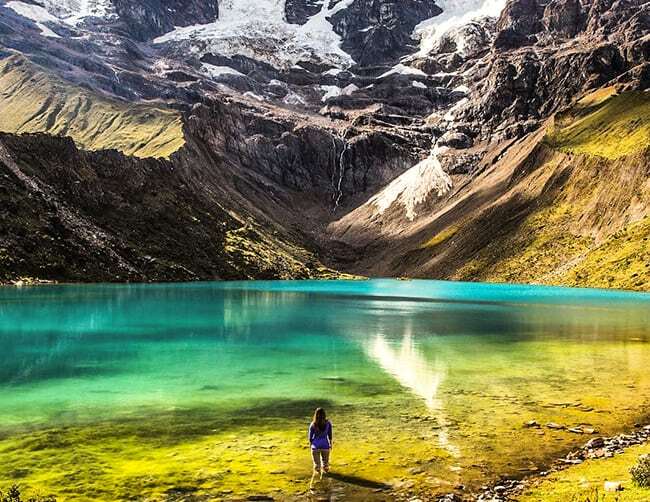 Lake Humantay is a spectacular 1 day hike by either group tour or private car. From your Cusco hotel it is 3 hrs to the start of the hike. Humantay Lake is fantastic option for those looking to do more hiking without camping. Humantay is a snow capped peak 5835M (19,140 ft) above sea level and Lake Humantay is a glacier created lake at the foot of the mountain. Bring a picnic lunch, camera, water and dress in layers since this a wonderful spot to spend the day. All hotel, train, tour, port and airport in-out private transfers. All private guided tours w/ professional bi-lingual English speaking guides. All accommodations in tourist quality hotels centrally located. Roundtrip bus tickets Aguas Calientes-Machu Picchu-Aguas Calientes. Roundtrip train tickets to Aguas Calientes. 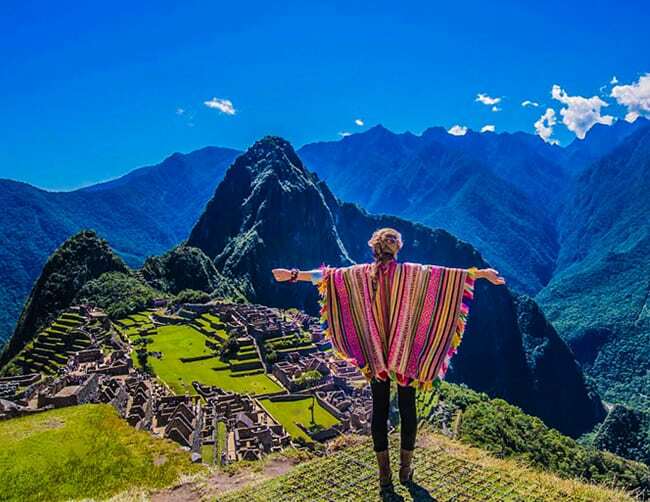 Private tour of Machu Picchu and admission. 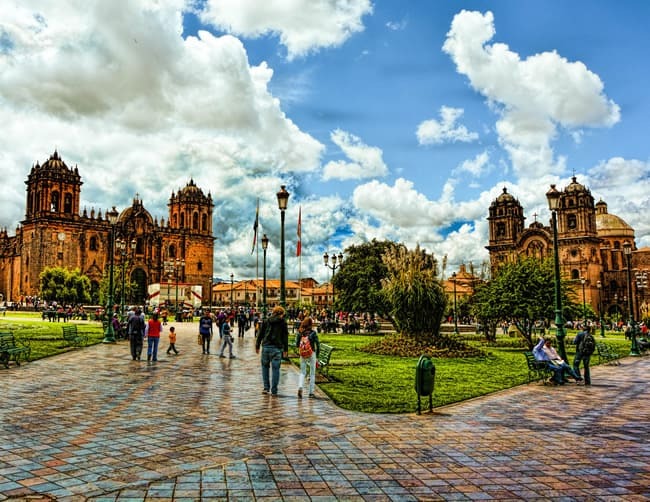 Private Cusco City Tour (Koricancha, Sacsayhuaman, Q’Enqo, Pucapucara & Tambomachay) and admissions. 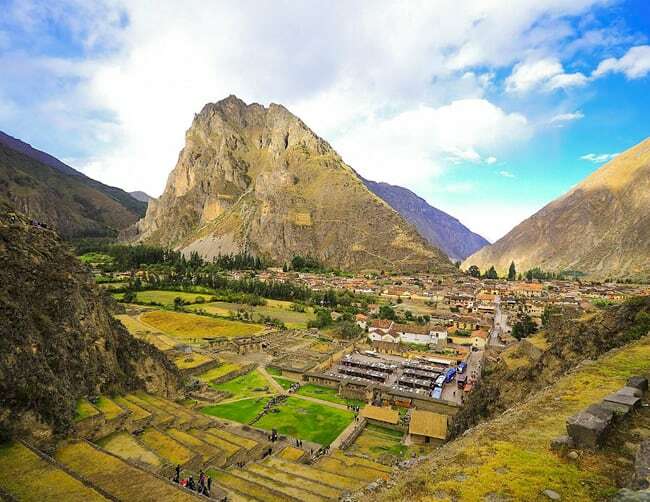 Private Sacred Valley Tour (Ollanta, Chincheros, lunch & Ollantaytambo) and admissions. Group or private tour to Lake Humantay w/lunch.